The break time here is appreciated as a time to rally myself and actually start thinking about this season, now that I am past the rush of the opener (for good and for ill). And I need to face my fears and deal up front with the specter of 0-8. We are 0-2, looking down the barrel at the Chicago Blackhawks, and a west coast trip to California. So opportunities to get beat abound. But I suppose that in most instances when a team starts THAT poorly the encounter another team that just doesn't show up to play, and they pop that first win in under 8 games. At least that's what I tell myself. The game against the Sharks was instructive. A 3-2 loss, with an empty netter that gave the Sharks a 3-1 lead. I was on my way to get a post game table at a local restaurant when the Jackets scored with 22 seconds left to make it 3-2. Hmm. Well, the Sharks probably stopped skating after the empty netter. The thing that is intriguing is how the rookies played into the flow of the game. The first rookie contribution was a 4 minute double minor high sticking penalty on Oliver Bjorkstrand. Not the contribution he was looking for. The CBJ killed off the double minor with elan, but San Jose gained momentum and scored two quick goals to take over that first period. From there the end result really wasn't in doubt. Which is not really my point. My point is that rookies Zach Werenski and Josh Anderson scored their first and second NHL goals respectively to complete the CBJ scoring. The thought is that as the rookies go, so will fare the team this year (assuming adequate NHL goal tending). Oliver Bjorkstrand has not had a particularly sparkling preseason and training camp, though he did score a couple of goals. But he is still adjusting to the shift in pace in his first real foray into the NHL. Yes, I know he played games last year, once he was up to pace and playing well. Last year in Cleveland he did not get off to a roaring start to the season, but he finished very strong. So he may take a while to get up to pace in the NHL as well. Bjorkstrand should be able to score at this level, there is no real reason to think otherwise. However, the timetable is uncertain. Seriously though, can we at least see a Saad-Wennberg-Bjorkstrand line for more than one shift? It would be interesting to see what would happen. Which leads us to Zach Werenski. His goal was classic Werenski, a tricky little snap shot filtering through the small spaces that got to the net and went in. Good for Foligno for setting a good screen and getting out of the way, but the shot was on net. Which is what Werenski seems to do, put his shot on net, which compliments his smooth skating ability nicely. I have been really high on Werenski since Lake Erie's run to the Calder Cup Championship, as I felt he transformed their defense. It looks as though he may be well on his way to transforming the CBJ's defense in the same way he did the Monsters. This is a very, very bright spot for the organization. I was surprised, but pleased, to learn that Josh Anderson got that last goal. After a middling training camp performance, I thought he was one of the best players on the ice against San Jose. 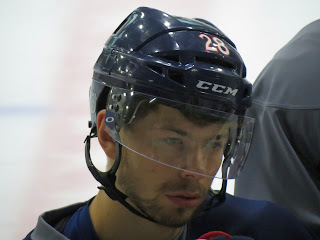 He was a really big factor for the Monsters down the stretch, and I wonder if he can become that factor for the CBJ. These things aren't certain for Bjorkstrand and Anderson. Some players can do it at the AHL level, but can't do it at the NHL level. We think these guys can do it at the NHL level, and the organization has not rushed their development. So succeeding at this level is something these guys were drafted and developed to do, and really, they should be fine. The only question is how long to get there, and how high can they climb? The road ahead is tough. The CBJ need to find the win column against teams that were in the playoffs last year. I think they can (hope really); I want them to start winning. Last year the season got by us before it started. I think Todd Richards had 3 practices in the regular season before he was fired. Torts has a long break here to settle things, and get them ready for Chicago. That works to our benefit.